One of the most recognizable features of Microsoft’s Windows OS is undoubtedly MS Paint. This simplistic image editing and drawing software came preloaded with all Windows installation, and its basic nature and widespread availability made it the go-to tool for simple edits on images. Whether it be resizing canvasses or highlighting certain areas for your school presentation, MS Paint was there and served without fail. The upcoming Windows 10 Fall Creators Update marks the end of the development road for Microsoft Paint, as Microsoft has added Paint to the list of features that are no longer in active development. Such features are deemed “Deprecated” and might be removed in future releases. Contrary to what several tech blogs are headlining, MS Paint is not removed just yet as it will likely continue on in future updates. The change here is that it will no longer be under development and can be removed in future releases without any need for further communication from Microsoft’s end. Microsoft has not revealed when exactly this removal will take place, but the end for Paint is just around the corner now. Paint made its first appearance in the very first version of Windows in 1985. The focus for this image editing app was never to be the best in its job, it was simply to be there. It wasn’t even until Windows 98 that Paint could save in .jpeg. Microsoft did improve Paint in recent years, but it still could not compete against other “simple” offerings such as Paint.NET and on a grander scale, Adobe Photoshop. For me, Paint will always occupy a special place in my heart. Paint was always there on every computer, and this reliability and accessibility was what the 7 year old me appreciated when boredom struck. The simplistic nature of Paint meant that a 90’s child who could use a mouse could go on to create mountains and clouds and rivers, with the sun peeking out from the edge and stick men working in their fields… and then proceed to destroy it all with zigzag lines and mismatched color splotches when he got bored. Paint was also there when one had to crop images to fit into powerpoint presentations as a 13 year old, or when one needed to draw devil horns over a friend’s birthday photo. And Paint was also there when 23 year old me wanted to make a feature image for use in an article announcing Paint’s deprecation. Paint is “succeeded” by Paint 3D, an app that features 3D image manipulation tools as well as 2D image editing. But the difference in functionality and ease-of-use is apparent from the very start. Paint 3D also loses out on Paint’s strongest point of availability, as Paint 3D currently puts in minimum requirements which many users would not be able to meet. The limited availability then affects the familiarity with the software and ends up making the learning curve much steeper than it should ordinarily be. The final release date of the Windows 10 Fall Creators Update is still unknown. 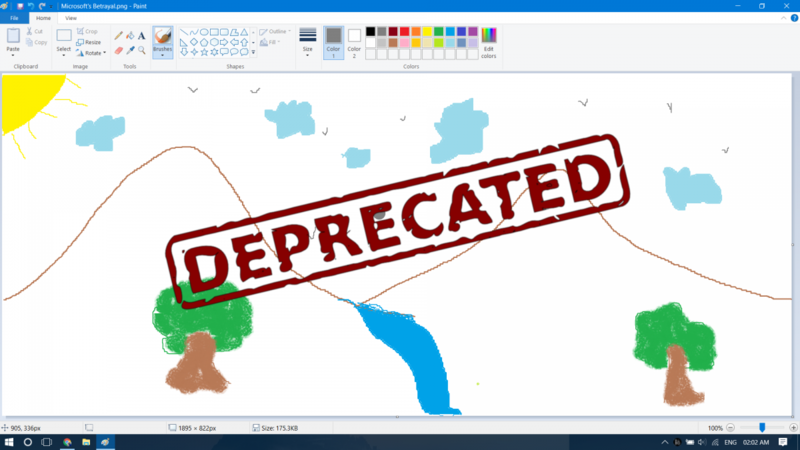 We hope Microsoft chooses to let Paint remain as part of Windows despite its deprecation. Just for old times’ sake! What are your thoughts on Paint’s deprecation? Do you have any Paint memories to share? Share it with us in the comments below!